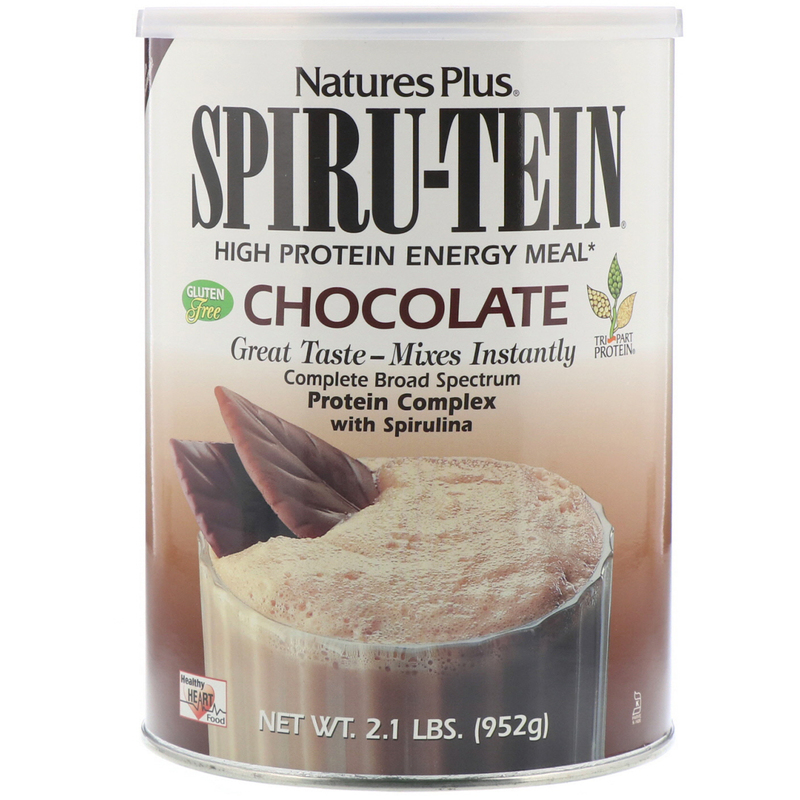 Add one heaping scoop (scoop included in can) of Chocolate Spiru-Tein powder to 8 fl oz of skim milk, whole milk, or juice, and mix (or shake) until smooth. For best results, milk or juice should be very cold. 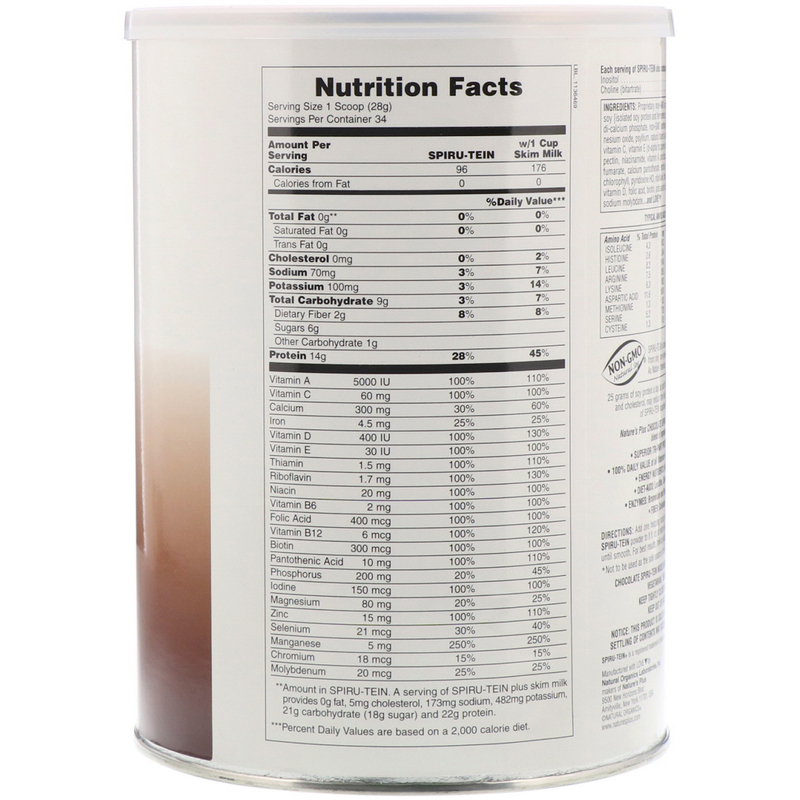 Proprietary non-GMO protein blend (rice protein, pea protein and soy [isolated soy protein and fermented soy]), fructose, Dutch cocoa, oligofructose, d-calcium phosphate, Non-GMO xanthan gum, potassium citrate, guar gum, magnesium oxide, psyllium, natural flavors (vanilla), microcrystalline cellulose, spirulina, vitamin C, vitamin E (d-alpha tocopheryl acetate), choline bitartrate, inositol, apple pectin, niacinamide, vitamin A palmitate, zinc oxide, manganese sulfate, ferrous fumarate, calcium pantothenate, lecithin, lemon bioflavonoids, papaya, bromelain, chlorophyll, pyridoxine HCl, riboflavin, thiamine HCl, vitamin B12, (methylcobalamin), vitamin D, folic acid, biotin, potassium iodide, chromium chloride, sodium selenite, sodium molybdate...and Love♥. **Amount in Spiru-Tein. A serving of Spiru-Tein plus skin milk provides 0 g fat, 5 mg cholesterol, 173 mg sodium, 482 mg potassium, 21 g carbohydrate (18 g sugar) and 22 g protein.